Malcolm Turnbull has been left weak and humiliated by the election result. He is already under pressure from the hard right inside his party. This saw him backflip over nominating Kevin Rudd for the UN Secretary-General’s job, leaving him looking vindictive and petty. But he was also forced to back down over his choice of Brian Martin to run the Royal Commission into juvenile detention in the Northern Territory, in the face of outrage from the Aboriginal community. Martin was forced to resign within days of his appointment. The Liberals’ loss in the final undecided seat of Herbert means they now have the thinnest possible majority of just one vote in the lower house. In the Senate they will have to win support from an even larger crossbench rabble than before the election. Turnbull will not be able to get legislation through unless he has either the support of The Greens, or else both Nick Xenophon and Pauline Hanson’s Senators. This means his government will be unstable and weak. Turnbull will be constantly looking over his shoulder, worried about whether any of his MPs will break ranks and about his electoral popularity. The government will be vulnerable to public pressure. We need to respond by going on the offensive to pile pressure on them from the left. Turnbull still plans to reintroduce the anti-union ABCC legislation as one of his first acts in parliament. Depending on the mood of Nick Xenophon and Pauline Hanson the government may still be able to pass it, either through the Senate or at a joint sitting of both houses. The unions need to call demonstrations now to put the maximum pressure on every MP and Senator not to vote for the bill. 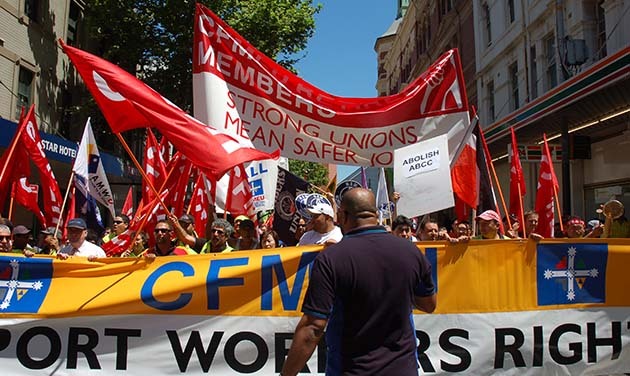 The unions’ decision not to raise the issue during the election campaign means far too few people understand the threat to the construction unions. A visible campaign of union stopwork demonstrations can turn this around. The victory by workers at Coles’ Polar Fresh warehouse, who picketed to block trucks, shows what is needed to fight and win. The Royal Commission into Don Dale and detention in the NT also needs to be a focus for ongoing campaigning and mobilisation. The inquiry is an attempt to bury the issue. It will almost certainly find that NT governments, Labor and Liberal, knew about the treatment of Aboriginal kids. Federal Indigenous Affairs Minister Nigel Scullion, who lives in the NT, also knew. The punitive policies of the NT Intervention and cuts to Aboriginal services are also to blame for worsening the social catastrophe in Aboriginal communities. The fight for equal marriage can also cause problems for Turnbull, with much of his party vehemently homophobic and opposed to granting marriage rights. He may now struggle to get the support of parliament for his plebiscite on the issue, meaning the demands for a direct vote in parliament will grow. And there is a looming crisis over offshore detention of refugees. Efforts to speed up the closure of the Manus detention centre are still working their way through the PNG Supreme Court, after it was found to be illegal in April. We need to demand that all those in detention on Manus and Nauru be brought to Australia. We have already seen how the election of Pauline Hanson along with four other One Nation Senators will give racism and Islamophobia a greater public platform. Already she has appeared on ABC’s Q&A, a new SBS documentary, and news websites like the Sydney Morning Herald and news.com.au are republishing her videos from Facebook. Sunrise has given her 20 appearances since September, according to a count by Media Watch. This has already encouraged an increase in racism, with the TV personality Sonia Kruger calling for a ban on Muslim immigration on the Today show. The immediate threat is that anti-Muslim racism will become even more acceptable. Pauline Hanson’s return is largely a product of the misery of rising unemployment, spending cuts and the mainstream Islamophobia coming from the Liberals and the mainstream media. Turnbull is doing his best to continue where Abbott left off, announcing still more “anti-terror” laws. The government now wants to be able to jail terrorism offenders indefinitely, even after their sentences have been served. There is now a renewed importance to finding ways to counter Islamophobia, through broad based public demonstrations and campaigning to take on the racist lies. We have to fight both Hanson and the mainstream Islamophobia together. The election result was a rejection of the Liberals’ plans for cuts and policies that favour big business and the rich. But it’s no use just sitting back and watching as Turnbull tries to deal with his nightmare of internal opposition combined with the Coalition’s knife-edge parliamentary numbers. Social movements, unions and the left need to take advantage and step up the fight to finish off Turnbull and the big business agenda he stands for.